A student at Fashion Institute of Technology in New York City has been charged with terrorism after posing with a pellet gun on social media and sharing ‘active shooter’ threats. The video was said to have been recorded on the site of the school, according to authorities. When classmates saw it had been posted at around 5:30pm, FIT issued a ‘shelter in place’ warning to all students and teachers from about 6pm to 7pm in response, causing faculty to hide in fear in classrooms and closets, according to CBS local news outlets. He was in my class. He asked the professor to leave early because he didn’t feel well. The witness told reporters the suspect walked out, then posted the video in question to social media, holding what appeared to be a handgun. Another picture was posted to the suspect’s Instagram account, appearing to show Lee holding two firearms and wearing a gas mask. Responding to the video, heavily armed cops from the NYPD’s Emergency Services Unit swarmed the school as the ‘shelter in place’ demand was broadcast, advising those present to immediately hide. Police found the student just over an hour later at a Barnes & Noble book store one mile from the school, near Union Square. They recovered a pellet gun and a gas mask. Officers were praised for their quick response by the 10th precinct’s Commanding Officer Captain Kevin Coleman, who dubbed their efforts ‘excellent teamwork’. Lee is facing several charges including criminal possession of a weapon and two counts of terrorism. Police believe there was no other threat against the school on West 27th Street. 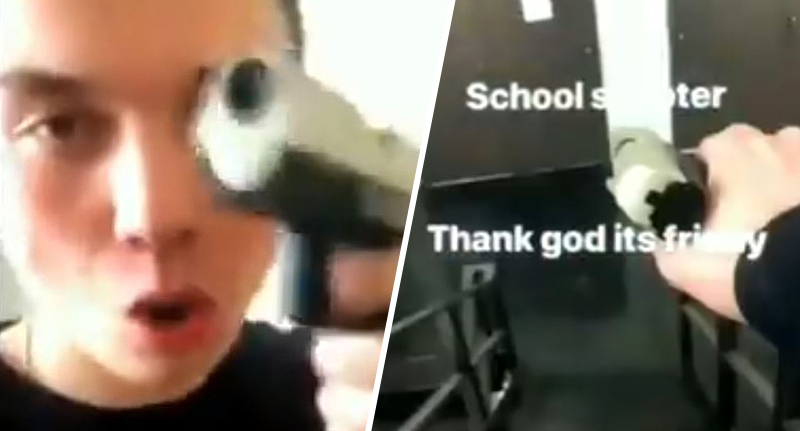 However, Lee has been arrested and taken into custody for allegedly posting these harrowing ‘active shooter’ threats on Instagram, which terrified classmates and teachers into a panic, officials said on Saturday 6 April, one day after the incident took place. He was taken to a local hospital, Bellevue, for an evaluation.